Storming the field: Rachel Mann ’18 faces off against Hamilton on October 15. 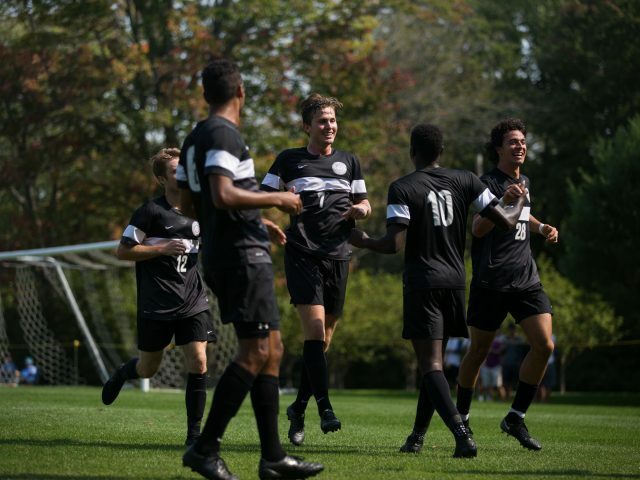 Bowdoin lost to its opponents 2-1, but beat Colby 2-1 the following day. 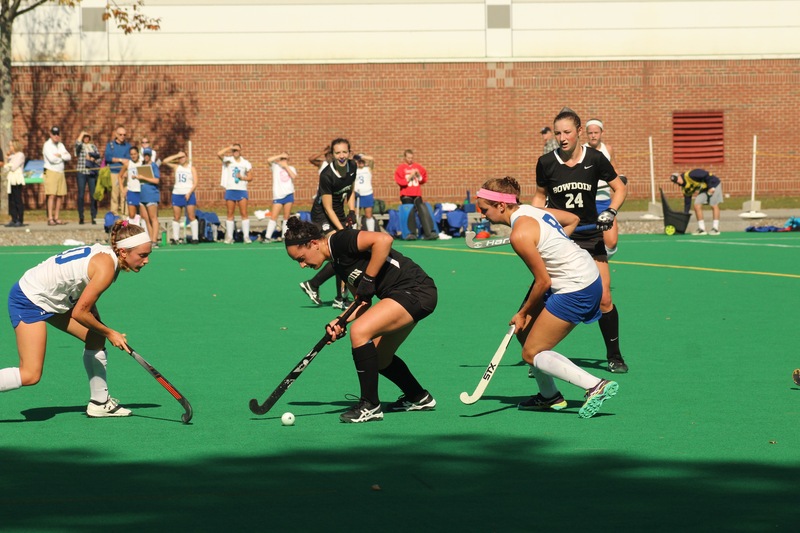 After entering the NESCAC Champions hips seeded 7th, the lowest in program history, the field hockey team (10-6, NESCAC 5-5) pulled off a dramatic upset on Saturday, beating No. 2 Tufts (11-5, NESCAC 8-2) 2-1 in the NESCAC quarterfinals. This win came just three days after losing to the Jumbos 3-0 in the last regular season game of the year. 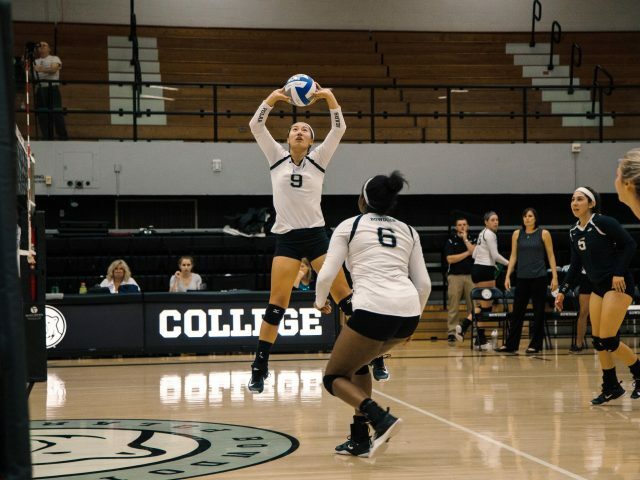 The team not only avenged its Wednesday loss, but also staged a comeback within Saturday’s game itself. Going into the second half, the score was 1-0 in Tufts favor, but a goal from Elizabeth Bennewitz ’19 in the 39th minute tied the score up, with another goal from Emma Stevens ’20 in the 53rd minute cementing the Polar Bear’s win. Captain Juliana Fiore ’18 credits not only these goals, but also great efforts from the defense and goalie for the team’s win. Goalie Maddie Ferrucci ’21 finished the game with five saves compared to Tufts’ three. The win makes Bowdoin the third No. 7 seed in NESCAC field hockey history to advance to the semifinals. “It was a huge win for the team, and we knew going into the tournament that the stakes are always higher. I thought that the team really rose to the occasion and it was by far the best game we’ve played all season,” Pearson said. Despite the Polar Bears’ lower ranking, Fiore believes that no team had a strong advantage. The team has the same mentality going into the game against No. 1 Middlebury. The Panthers are currently on a ten-game winning streak and looking to advance to their seventh straight semi-final game. When the two teams faced off earlier in the season, the game went into double overtime and the Panthers came out with a 1-0 win. One of Middlebury’s greatest strengths is its offense. Currently, it has the top offense in the league, with 37 goals compared to Bowdoin’s 19. “They’re obviously playing very well at the moment, they’re a fast and skillful team … so I think we’re going to have to just match their athleticism and skill, and play well defensively and make sure that we execute all of our offensive chances,” said Pearson. 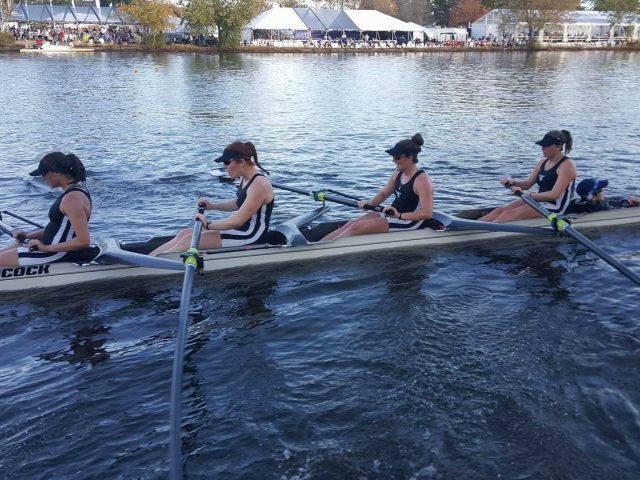 Last year, Middlebury beat Bowdoin in the quarterfinals, ending Bowdoin’s season. This year, Fiore believes that the team is trying not to focus on Middlebury, but instead focus on reaching the championship. The team will travel to face off against the Panthers on Saturday at 11 a.m.
Horace Wang contributed to this report. Saving shots: The men’s soccer team (10-3-3, NESCAC 6-2-2) had a dramatic win against Williams (8-3-5, NESCAC 3-3-4) on Saturday after the game went into a penalty shoot out. Levi Morant ’19 scored the first goal of the game in the 54th minute, but Williams tied the game up 25 minutes later.